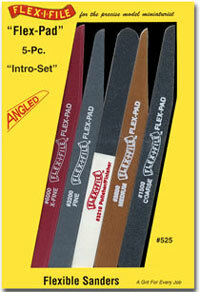 Flex-I-File finishing abrasives are highly rated among modelers for their unique ability to get into the smallest places. Very handy and easy to use. A perfect combination for the beginner or advanced model builder. Full range of color coordinated grits. Padded support in handy ½" x 6" size, provides evenly distributed pressure over broad concave and convex surfaces. Ideal for sanding and blending materials of dissimilar texture and hardness without digging in or sratching. May be used wet or dry. Double sided. Double sided.